grandma's cookie jar: Happy Times Magazine - I'm Giving Subscriptions Away! Happy Times Magazine - I'm Giving Subscriptions Away! One thing we do as grandparents is look for resources we can use to pass faith to the children we love. 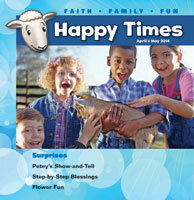 Concordia Publishing House recently emailed me a couple of their Happy Times Magazine which is designed as a tool for parents/grandparents to use to pass faith to preschool age children. Today I'm happy to let you know about this resource which you could use with your grandchildren - and announce a giveaway as well! You will find the information you need about Happy Times at this link, along with another link you may follow to see a sample issue. And, as I mentioned, Concordia is making five subscriptions available for me to give away (USA only) on September 28, 2016. So, if you live in the USA, are over the age of 18 and would like to win a year subscription, please comment below to share how many preschool-age grandchildren/children you have who would enjoy Happy Times Magazine - two of my grandsons are preschoolers. In addition, you will receive additional entries if you have followed on Google+, Google Friend Connect, followed by liking on facebook with the tab at this link (not just liking the post) and/or have followed grandma's cookie jar by email. For each of these which you have done you will receive one entry. In addition, if you "share" this post, you'll receive an additional entry (please let me know if you share). This will help me be able to draw names from among people who would like to win a subscription to Happy Times Magazine and it gives you several ways to enter the give-away! I have 3 preschool grands that I would share this magazine with! I have one granddaughter and several kids in my children's ministry who could benefit from this magazine. Thanks for the chance to see it.